How do you know an American Elm when you see one? Here are some characteristics of American Elms that will help you identify these trees on the streets of DC. 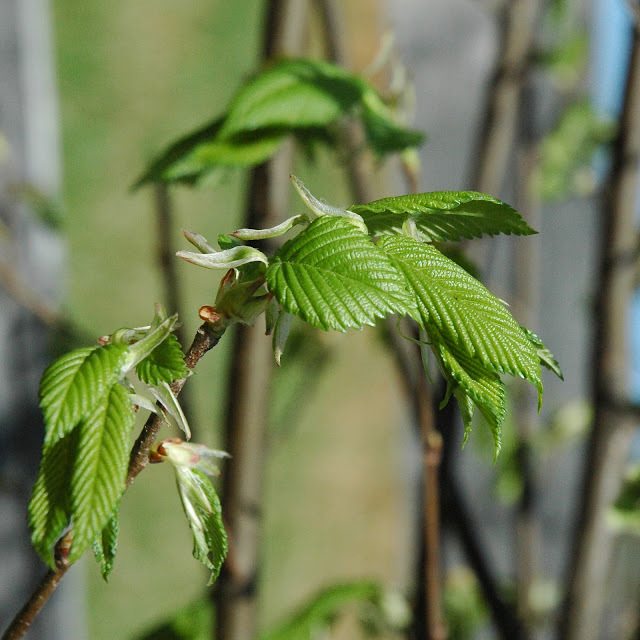 Note the serrated edge and ovate shape of these emerging elm leaves. Size: Can reach 100 feet tall or more, but generally mature city trees are 60 to 80 feet. Trunk and branches: Vase-shaped with a canopy almost as wide as its height. Thick columnar trunk divides into large branches and then smaller branches that arch outwards. On classic elm-lined streets, mature elms often branch across the roadway. Leaves: Alternating simple leaves that are ovate in shape. Doubly serrated with straight veins. Various sizes, but leaves usually are 3 to 6 inches long. Dark green in the summer. Notably, the base is asymmetrical (meaning one side of the leaf is broader than the other). Twigs and buds appear in striking zig-zag formation. Fall appearance: Yellow or brown leaves. Bark: When mature, dark gray-brown with deep, crossing ridges. Bark can be scaly when young. Flowers: Tiny petal-less reddish flowers on pendulous stalks. Not showy. One of the first trees to flower, often in late winter before the leaves emerge. Fruit: Small round, flat and papery-looking, with a notch at the apex. They are samaras, containing a single seed, and can be green or yellow. If you're looking for American elms in the city, the obvious place to look is the National Mall where there are hundreds lining the walkways and surrounding the monuments. 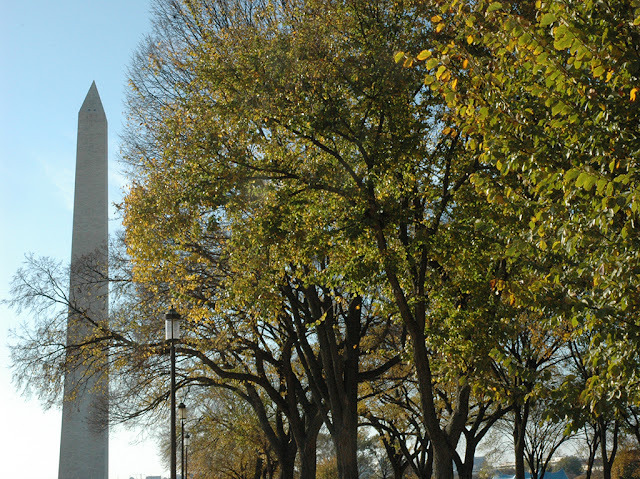 Additionally, at Lafayette Park and other sites near the White House there are many elms to see including mature specimens and the "Princeton" cultivar planted by Casey Trees along Pennsylvania Avenue. When Casey Trees inventoried the trees on the grounds of the Smithsonian Institution last year, we documented 165 American Elms, making it the Smithsonian’s most common tree species. Other locations include: New Hampshire Avenue NW (including Dupont Circle), North Carolina Avenue SE/NE and East Capitol Street in Capitol Hill, and Lamont and Park Streets NW in Mount Pleasant. The vase-like spread of American Elms on the National Mall. Learn more about our American Elm Restoration program on our website, including new planting locations for elms this winter.